This week we went through the process of brainstorming, using our research to come up with as many ideas as possible and then narrowing them down to the six best entries to further ideate on. We did this through two distinct sessions. As part of class time on Thursday, we got together with our paired group (Chris Jung, Taysser Gherfal, and Ye (Irene) Yuan) and did a wide-scope brainstorm, stepping back from the categories we’d begun to drift toward from our research and looking at the problem from a wide lens once more. We weren’t necessarily coming up with distinct ideas yet, but rather categories of things we, as users, would want from a provider-finding tool. Chris was kind enough to facilitate and write our ideas down on the whiteboard as we came up with them, as it was a low-energy sort of day and many of us were approaching zombie status. Following that session, the three of us gathered again on the night of November 1st in the lab to brainstorm further, narrowing down actual ideas within the sphere of information hierarchy that we’d established in our previous research presentation. We established five subcategories, and brainstormed ideas in a concept map format on five sheets of 11×17 paper, with each subcategory in the middle, branching off into the various ideas. 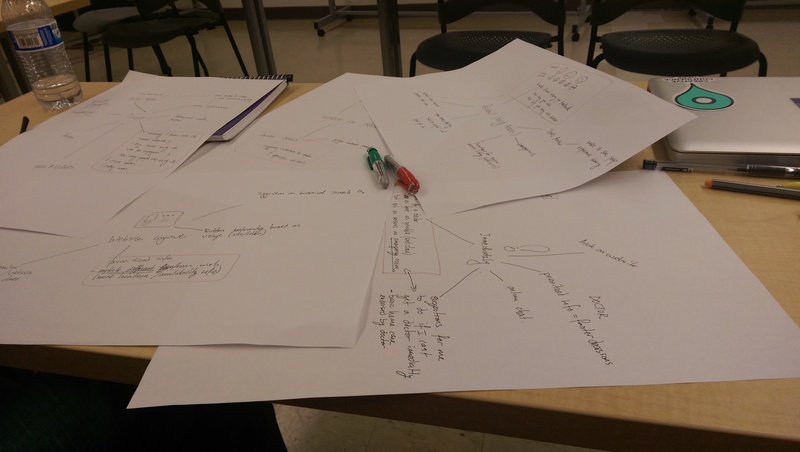 This was fruitful, as we had some framework to base our brainstorming on, and every time we got stuck, we just moved to a different paper and worked on that instead. 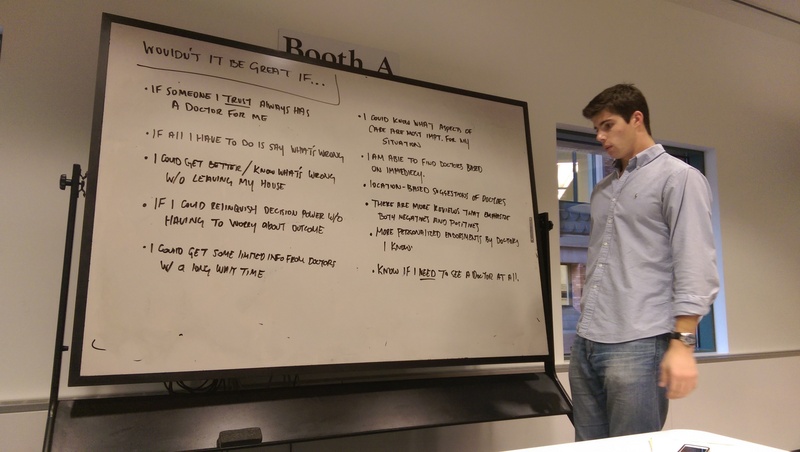 In just two and a half hours, we had over 50 ideas written down! 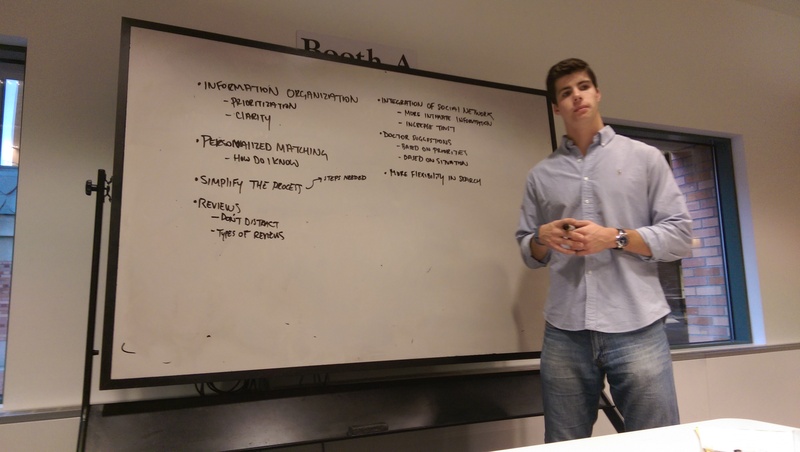 From there, we narrowed the ideas down to those which we felt were most topical, implementable, and interesting, deciding to sketch and focus on those for our concept presentation on Tuesday. Acacio took on the work of sketching, while Joy wanted to try her hand at Keynote to make our presentation. (I remained on blog duty, as I often do.) We’re starting to feel very cohesive as a group, and we work very efficiently together; there is very little time wasted on awkward deliberation, as we can come to consensus with minimal fuss, and move to actually getting the work done. Next week, we will ideate!